I keep pushing the idea that participation in convention panels should be open to the public, and the panels pitched SXSW-style: that is, a group of panelists puts together a panel proposal, and then members vote on the panels they want to see. All too often people in the audience (at least some of them) know more about the subject than those on stage. It's an interesting idea, but for a volunteer organization to implement successfully... pretty challenging. The sausage-making of coordinating the schedule of some several dozen programming participants into a cohesive set of panels, readings and events is an undertaking, especially when done almost entirely out of love. Adding another layer of democracy to that undertaking is not something I would wish on anyone. That said, the underlying complain has validity. Lord knows that at the conventions I've attended, I've seen some panels where the members really didn't have much business being on it. Hell, I've been on panels where I didn't have much business being on it. At least this time around, my two more problematic panels were subjects I had an interest in, and had done some research on the subject beforehand. Even if you line up participants-to-panels perfectly, however, any panel that isn't just one person giving a set lecture (and thus... not really a panel) is going to be an organic thing. Unless the moderator rules it with an iron fist, it's going to go where the people on it are going to take it. Not to mention, any given panel usually has its title and, perhaps, a sentences or two of extra description. The programming coordinator might have had one idea of what a panel is going to be about, while the participants might-- each individually-- have another, and members of the audience something completely different from all of that. Sometimes you just ride the wave where it takes you. On top of that, when the context is a SF/F/Genre/Lit Convention, I don't think anyone in the audience is expecting or demanding of academic credentials from the panel. They know that the panel consists of spec-fic writers who are mostly doing what they know best: speculating and story-telling. Besides, in my Alcohol In Speculative Fiction panel, I don't think anyone wanted me to drone on about the history of development of beer, wine and distilled spirits. All that said, there's nothing wrong with just plain bowing out of a panel in which you would truly be out of your depth. I was assigned one originally at ArmadilloCon that I was totally at a loss about, and immediately asked to be taken off it. Though, to a degree, if you're up on a panel, on some level you are presenting yourself as an "expert", and it's good to do your best to show yourself as one. Or, if nothing else, be up front about your lack of expertise. And be entertaining. That's the thing I most want from a panel, after all. So now ArmadilloCon is done, and it was a lovely time. Friday was the Writers' Workshop, where we had plenty of good discussion in the morning sessions, and my critique students were an excellent group of people who are all on the verge of breaking through to the next level. There were some administrative snafus (i.e., mistakes on my end of things), but our astounding volunteers Rebecca, Melissa and Beth helped keep things from flying off track. Plus I made sure Stina got a round of applause for all her years running the workshop. Apparently next year, I'll be in charge. Still contemplating that. Saturday, I returned for another of my nervous-about-this panel on Aztec mythology in genre fiction. Again, it went better than I had feared it would. I didn't make too much of a fool of myself, though we had one audience member who consistently had a light shake of her head and an expression of No, wrong, wrong. I found out after the fact that she was a PhD in Anthropology specializing in Mezoamerican cultures, so she probably had good reason. If you're reading this: Sorry. If I had known, I would have dragged you up with us. Alcoholic Drinks in Fiction became Alcoholic Drinks in Writers, since a wonderful member of the audience bough drinks for the panel. I may have prompted that a little. But it was a very fun panel. I hung around and did the BarCon thing for a while, mostly talking with Amanda Downum about each others work and alcohol, with Alex Renwick about the Olde Days of South Congress***, and becoming new Best Con Friends with Kat Richardson. Who is awesome. Plus many, many, many other people. 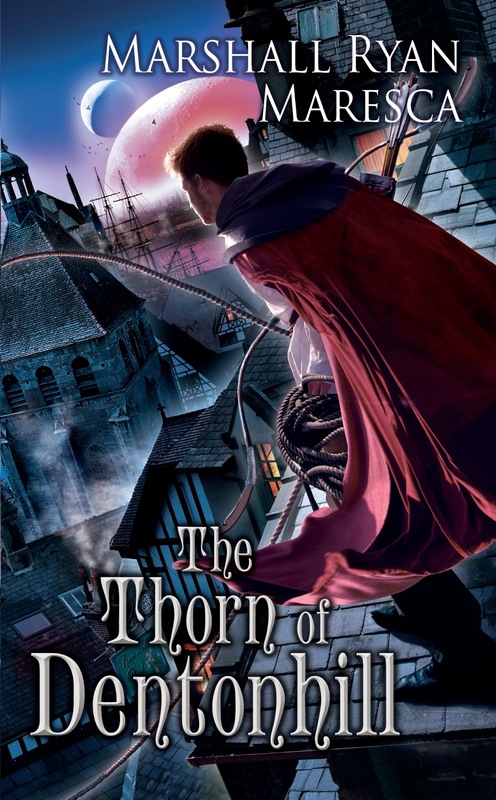 My reading went well, where I read the first chapters of both Thorn and Murder of Mages, and I was quite pleased. And I can fill up an hour, apparently. Good to know. After a bit more BarConning, my wife arrived at midnight to sweep me off to her event in a different hotel. Sunday's panels were early, which was a bit painful (see: swept off at midnight to a different event), but went well. Best Cons in Genre Fiction was loose and free-form, but Don Webb and Jayme Blaschke are very smart guys to be sitting in a panel with, so it worked quite well. The coffee had kicked in by the time I did Overhauling a Character, so I got to end my official con duties on a high note, as that was a good, vibrant discussion. *- Personally, I loved having the hotel relatively close to the house this time around. **- For those unversed in game-speak, that's essentially being quite out-of-shape or otherwise unhealthy. ***- By which I mean the 90s. ****- I actually got an offer for a small Project Beyond, so I need to think about what I might do for that. Tomorrow morning is the Workshop, and my whole weekend is ArmadilloCon (my schedule) so I don't have too much time to write here today. But I wanted to talk a bit about how getting to where I am has been a hard struggle. It's always been hard work, and plenty of times I really questioned myself whether it was worth it. Not to mention the world is full of discouragement. The odds of getting an agent's attention are astronomical. Publishers aren't interested in new writers. It's very hard to even get to here. But like Jimmy Dugan says, the hard is what makes it great. But that means you've got to fight through the hard. You've got to get up each time you're knocked down. You've got to take every scrap of encouragement and forage it together-- even some spare words of, "You've got a lot of real talent" and make that the only meal you're going to get all year. Keep fighting. See you in the word mines. I was commissioned to write two one-minute plays. Hint Fiction also required maximum value from each word. Very different writing muscles from novels, but useful ones to build. July is a busy month. So, I wasn't sure what I was going to write about today. There's a lot on my plate right now, including finishing edits to Murder of Mages, as well as finalizing other details for that (street map, acknowledgements, cover notes for artist), and on top of that ArmadilloCon and the Writers Workshop is in less that three weeks. And that's on top of the things I have to do to keep the mortgage paid and the lights on. Thorn Of Dentonhill is available for pre-order on Amazon! And it also has a Goodreads page! I'll admit, I completely geeked out when I saw an ISBN number. Again, it's the little things like that which bring it home: this is a really real thing that is happening. So that more or less made my week. *- By "discovered" I mean "ego-surfed and checked my Amazon author page".